We are handing you over luxury apartments to instruction 3 in Ditches. Everyone has an own car park and an enclosed area. Recommended accommodation in myriad, if someone wants a quiet and some rest. Apartments neat, look exactly like the pictures, the owners of which you can get things done. All in accordance with the findings, we as a family with two children. I highly recommend especially for families with small children. The owner gave us the keys, all showed and provided beach chairs, garden furniture and even a barbecue. The apartments are large, so even our 6 was comfortable. Fenced children can play and not run out into the streets. Very good standard at an affordable price. Living very large and fully equipped. In the house clean. All in accordance with the offer. The incredible thing is the fireplace when the evening gets chilly it can inflame and it feels when relaxing atmosphere. We spent the Miriadze with family all week and generally have no complaints. Quiet, large rooms, comfortable beds. The property is fenced, so the kids a lot of play in the backyard. It is a place to park your car. Extremely quiet place to spend a holiday, the same trenches were a most charming place this year for the first time and will be back next year. Overall, a good night’s sleep and a fireplace in the evening gave the climate. 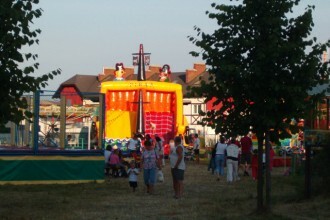 Every year in the same place distributed Fairgrounds. Street Baltic is some old equipment that we do not encourage adults to have fun. 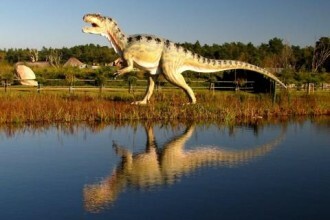 The first dinosaur park on the coast, where an area of 20 hectares, in the picturesque surroundings you can learn about 100 prehistoric reptiles. 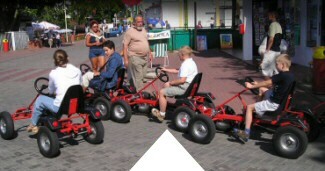 Rentals go-kart foot-operated. The cost to rent 5-15 zł for 30 minutes. Legend Rock Festival 2014 The exact date is not known yet but we will add it as soon as official information.